K-Motion Valve Springs are the choice of winning racers who demand the very best. K-Motion Valve Spring - Double H-11 w/ Damper - 1.550" O.D. K-Motion Valve Spring - Double H-11 w/ Damper - 1.625" O.D. K-Motion Valve Spring - Double Silicon - 1.460" O.D. Pit Stop USA is The Online Motorsports Superstore! K-Motion Valve Springs are the choice of winning racers. They know that K-Motion Valve Springs deliver the high quality and superior dependability required to meet their performance requirements. Whether you run on the drag strip, circle track, off-road or on the water, K-Motion Valve Springs can offer you the same performance to deliver you to the Winner's Circle, too. K-Motion Valve Springs start with the highest quality wire available. All of the four alloys used - Chrome Silicon, Special Silicon, H-11 Tool Steel and the proprietary M-3000 alloy - are all manufactured and inspected to the highest industry standards. Quality of the wire is the first essential step in manufacturing springs designed for extreme, high and aggressive cam lifts and ramp speeds. This is why K-Motion Valve Springs utilize four different alloys. After coiling the springs receive a variety of carefully controlled heat treatment and surface finishing processes. 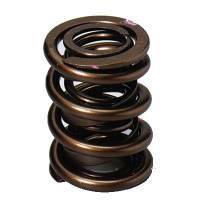 All of these are intended to reduce load loss and increase spring life. Each spring is then visually inspected for surface imperfections which could lead to early breakage. The dampers are radius ground and de-pointed for longer spring life. In addition, the oval track springs are radius ground on both ends of the inner and outer coils. Each K-Motion Valve Spring is then cold-pressed with as much as 2500 pounds of pressure, depending on the application. A pink stripe is added for identification then each spring is individually pressure checked and boxed with no more than five pounds variation per box. From design to manufacturing to load-matching spring sets, every effort is made to provide you the very best valve springs available. When you need valve springs, demand the very best, K-Motion Valve Springs! We feature K-Motion Valve Springs, K-Motion Valve Locks and K-Motion Titanium Retainers at low everyday prices!